The singer, who found fame in band Take That before forging a successful international career as a solo artist, has donated 150 personal items to the charity auction. All proceeds from the sale, called Doing it for the Kids – a line from Kids, Robbie’s 2000 duet with Kylie Minogue – will be donated to the Donna Louise Children’s Hospice, of which Williams is a patron. The singer described his work with the Staffordshire-based charity, which supports children with life-limiting conditions and their families, as “a privilege”. He said: “It’s a privilege for me to be a patron of The Donna Louise Children’s Hospice, it makes a real difference to these children whose lives have been tragically limited. Handwritten lyrics for Let Me Entertain You, one of Robbie’s best-selling singles, are expected to attract bids of £4,000- £6,000. A cream two-piece suit worn by Robbie in the music video for single Radio, which scored a number one hit for the star in 2004, is estimated at £5,000-£7,000. Other items up for sale include a Take That MTV video music award and a multi-platinum award for the album I’ve Been Expecting You, released in 1998. 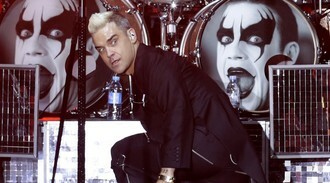 Bonhams’ head of entertainment memorabilia Katherine Schofield said: “Robbie Williams is one of the most successful British recording artists of all time. The auction will begin at 3pm at Bonhams Knightsbridge, and is being streamed live via its website.